Jake had proposed to me just before Thanksgiving to attempt a winter Pemi-loop aiming at sometime in January. 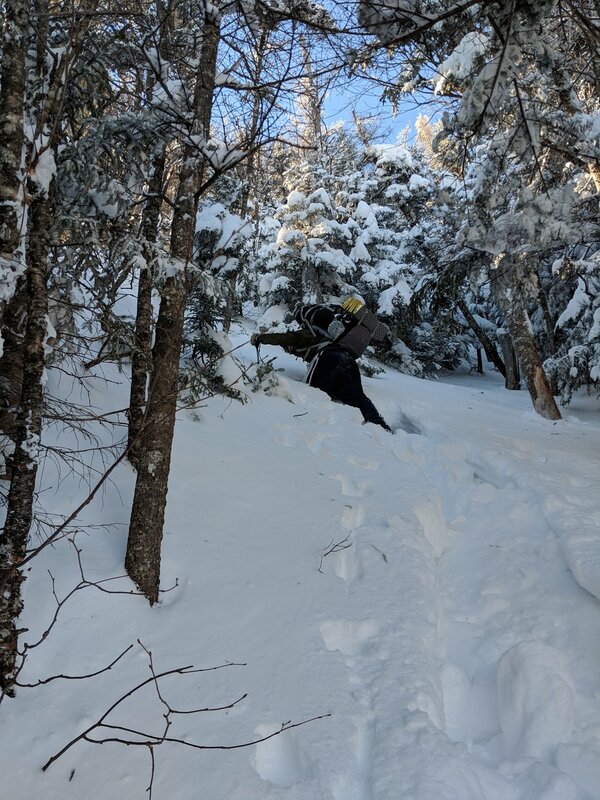 We completed a recon trip of the Franconia Ridge loop early December where winter conditions this year were perfect with a high base of snow generally making this popular yet difficult section easy to travel efficiently. 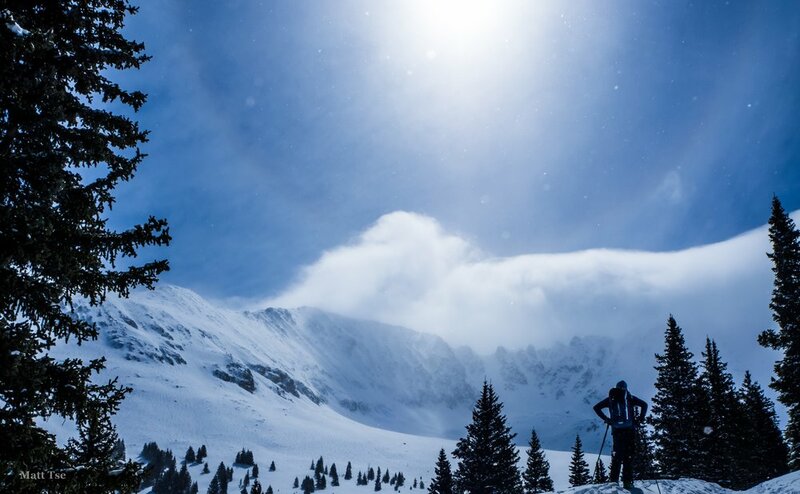 I spent the holidays away in CO and didn’t really have a feel for how the conditions matured, but the week leading up to our planned long weekend trip had stable snow conditions. Though as always, foresight could have made us a bit more open minded seeing as this particular weekend was just after the holidays and was forecasted to be consistent sub-zero Fahrenheit temps throughout the weekend. Employing my seemingly veteran winter expedition experience, I thought we’d have this in the bag even with the odds stacked against us. We departed Boston around 1 AM with coffee and a quick breakfast in our bellies arriving in the Lincoln Woods lot close to 3:30 AM. The plan was to reach the ridge, the top of Mt. Flume, traveling at an average of 500ft/hr with heavy packs (35-40lbs) and snow shoes with the daylight to warm the ridge traverse. The air that morning was very cold but thankfully was sheltered from most of the wind (unlike the parking lot). 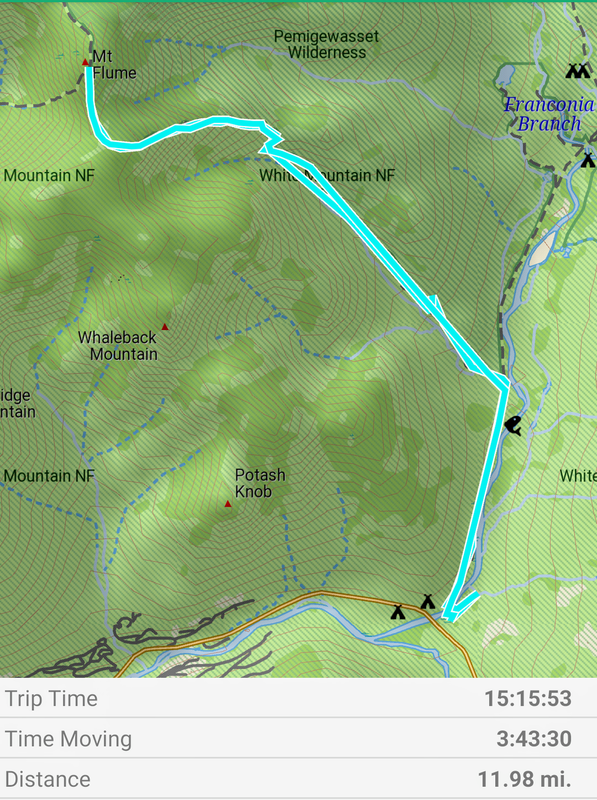 We traveled relatively efficiently stopping for 1.5 breaks to around mile 2 (1400’) where the packed down track ended. Slowly over the course of 7 hours did we realize the conditions were against us. The snow pack was aerated sugar over 60cm deep (my axe could plunge deeper) and the ladders nearing the top of Mt. Flume are a very steep gradient. Kicking steps with our packs on was excruciatingly tedious and cumbersome. We only hoped some party would speed on by us to take over breaking trail. We continued breaking trail for nearly 3000’ and 3 miles through the steepest section of the ladders all buried in the freshest light snow that would have made skiing unbelievable. Freezing temps, more alpine trudgery, and I lost my GPS watch somewhere in the ladders above this picture. Finally about 200’ from the summit of Mt. Flume, a solo day hiker on his way to Mt. Liberty came up behind us and after a quick exchange passed us and broke the last bit of trail. The time was 1:30 PM, we were exhausted, lower of trail food than expected, all reasons to bail on the whole trip. 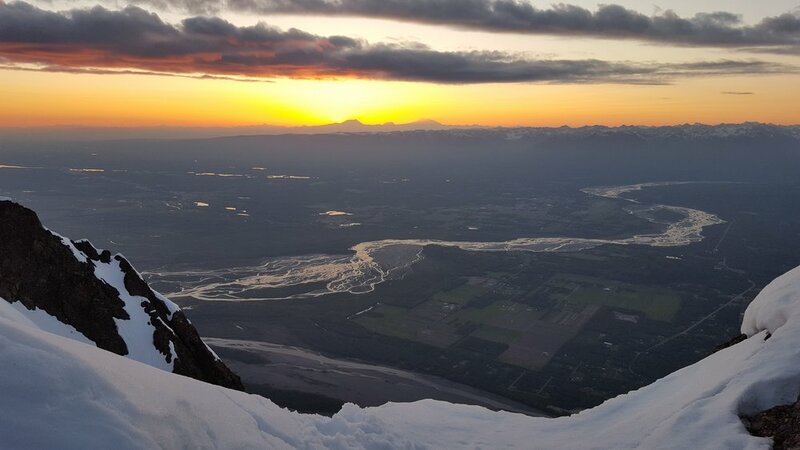 We dropped our packs and continued up to tag the summit. On the top, the gusts were easily over 30mph and we were glad to have made our decision to turn back. A little cold, very sore, and hungry to try again some other time. Delorme Track since my watch was sacrificed to the Mountain deities.